2018 saw the number of LNG bunkering vessels rise to 9, up from just 1 in 2017, according to the latest numbers from LNG bunker advocacy group SEA\LNG. The most notable of those additions is perhaps the 7,500-cbm Kairos that last month started operations in northwest Europe. It is the world's largest LNG bunker vessel. "From limited availability at select ports, LNG bunkering has grown to encompass 24 out of the world's top 25 and all but one of the top ten bunker ports globally," SEA\LNG Chairman, Peter Keller, said in post on the group's website today. He estimates 30 LNG bunkering vessels will be in operation within the next four to five years, based across key bunkering nodes in Asia, Europe, the Middle East, and North America. Among those will be the 18,500-cbm LNG bunker vessel chartered by Total to supply CMA-CGM's new fleet of 22,000 TEU container ships. WHen it comes into operation next year it will then take the title of world's largest LNG bunker vessel. Alongside the growth of the LNG bunkering fleet are a growing number of LNG-powered vessels, the number of which has grown globally from 118 in operation in 2017, to 143 LNG-powered vessels in operation today. 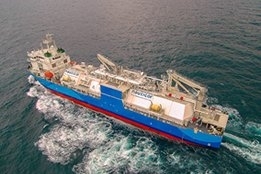 A further 135 are on order, and there are 135 LNG-ready ships either in operation or on order.